The tiny house movement has definitely matured and these days we're seeing microhomes with a very high level of aesthetic sophistication. 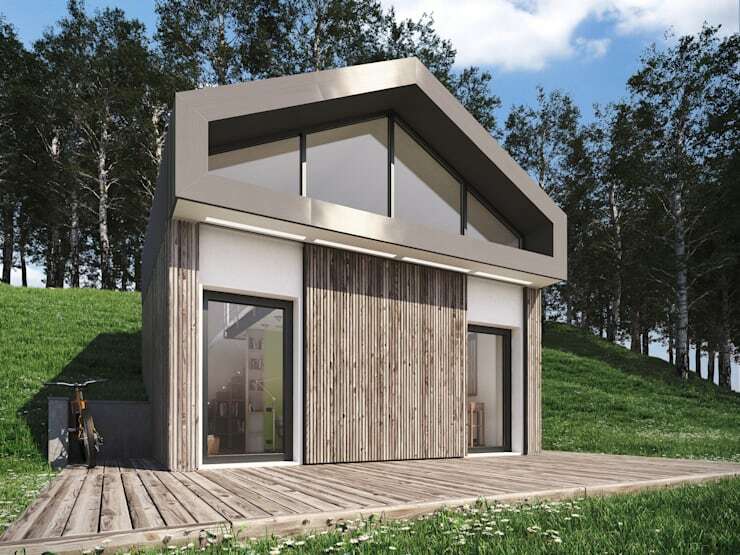 The microhome we're going to explore today is just 25 square metres. It's composed of a single cube with a pitched roof and the basic structure is so simple that the architects 3d-arch liken it to a child's drawing. There's something so raw and fundamental about this home, that it's no surprise to discover that the architects conceived of the home as a return to the concept of a home as a refuge from the outside world. The environmental benefits of small living are often impressive and this simple home has the usual benefits you might expect. But when you are designing with such a small area, the biggest aesthetic challenge is to circumvent the distinctive look of tiny living. In essence, it's difficult to make a small home feel bright, open and free flowing. To explore more, come with us on a photo tour of this lovely, tiny cabin. Enjoy! The home was built for a couple intending to use the place as a way to escape big city life, so the home has been built to provide maximum engagement with the surrounding views. Aside from the main building, the surrounding greenery has been left untouched and the contemporary rustic facade blends quite easily into the Italian countryside. Note that the front central panels can also slide closed to cover the front glass doors and provide extra privacy. With few interior walls, the designers have created a central living area with very distinct and separate living zones. This of course opens up the space and allows for the eye to continue through the space unimpeded. 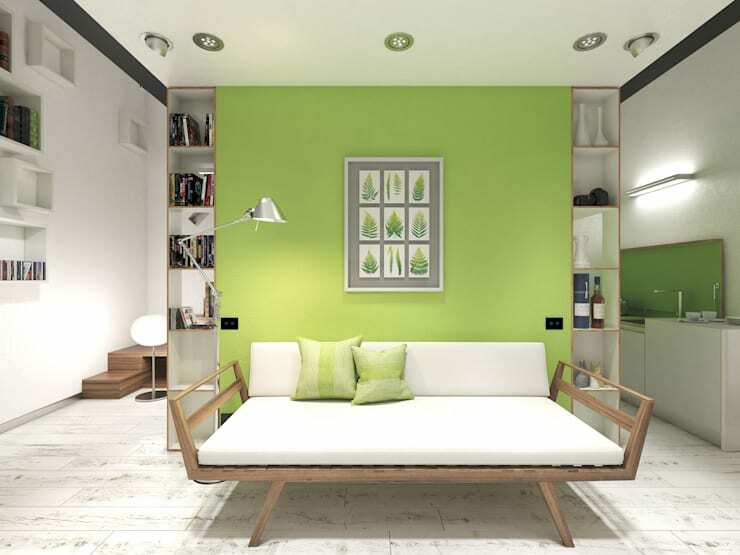 The strong apple green wall, built in bookcases and storage units have been used to delineate the different zones of the space. 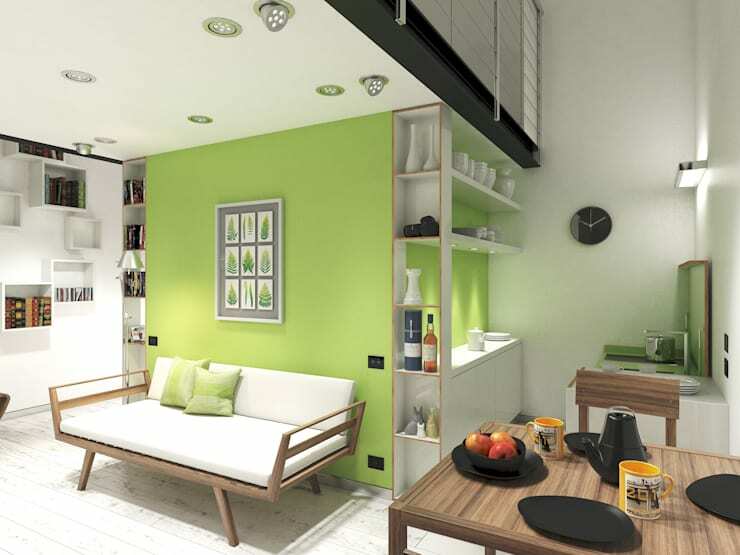 The apple green feature wall adds a fresh appeal to the space. The use of fine, minimalist contemporary Scandinavian style wooden furniture is a sophisticated touch. But most important of all, this avoids the addition of unnecessary visual weight to the room. In all, it's a living area with a bright, light ambience. On a side note, we love that the sofa is oversized. Living in a small space doesn't have to mean skimping on comfort! The cabin is only to be used as a holiday home, so the owners were content with a small kitchenette instead of a full sized kitchen. 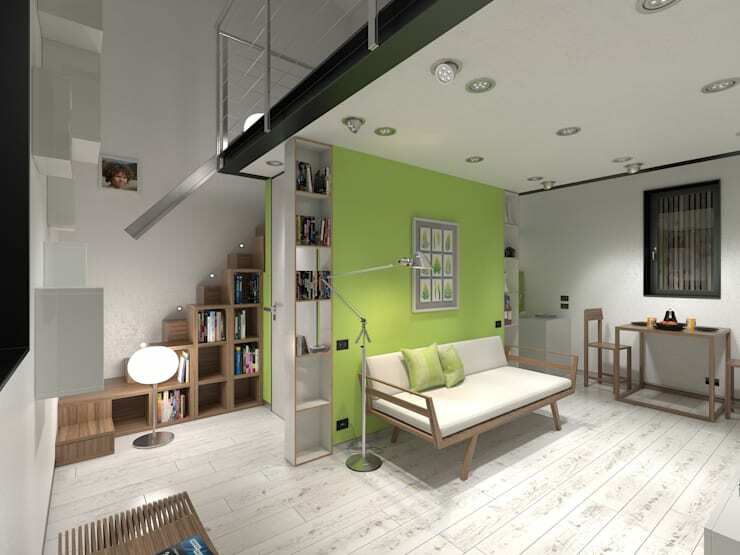 From this angle we also get a good sense of the entire layout with the bedroom mezzanine level we will explore later. In a home this small, it obviously pays to have multifunctional furniture. While the other bookcases have been used to delineate the living area, these bookcases have been used to double as stairs. The alternative steps of the double staircase with alternative steps add an extra layer of sophistication and interest to the design. Directly in front of us we have the small bathroom with shower. 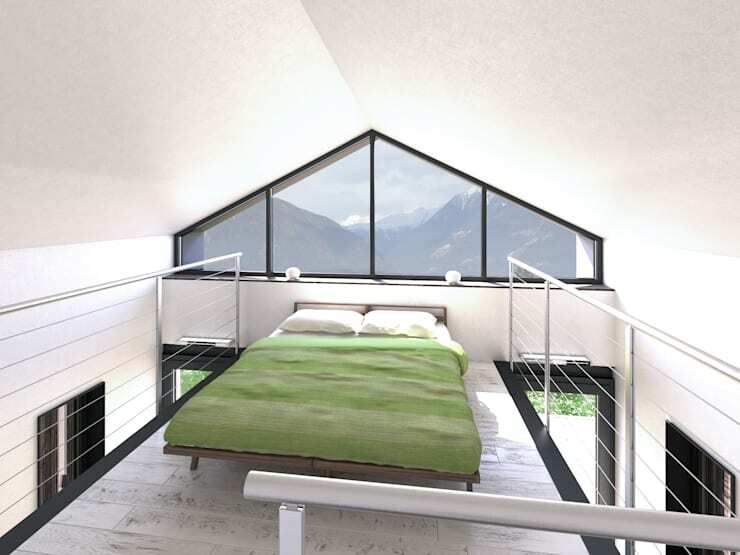 Finally we come to the bedroom mezzanine. 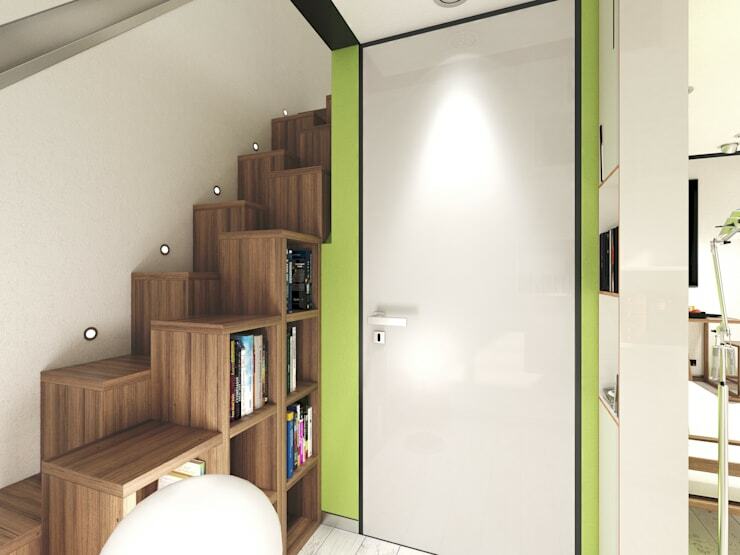 This level is just 10 square metres, but it's definitely one of the defining factors of this small home. The owners come here to enjoy the country, so obviously the views are all important. The very large opening allows for a lot of light to flood the interior and add to that all-important airy quality to the home. If you are interested in rustic homes, you'll love this Ideabook A bold Japanese home with a surprising interior. What do you think of this small country home? We would love to hear in the comments section below.